NASA has just published the most detailed view of the Universe ever taken. It's called the Extreme Deep Field—or XDF for short. It took ten years of Hubble Space Telescope photographs to make it and it shows some the oldest galaxies ever observed by humans, going 13.2 billion years back in time. It's a mindblowing, extremely humbling view. Not only for what it shows, but for what it doesn't show. While this image contains about 5,500 galaxies, it only displays a tiny part of the sky, a ridiculously small slice of the Universe. As you can see in the image below (make sure to expand it to see it complete), the photo only focus on a small area of the constellation Fornax. It is an insignificant part of the universe. An arbitrary sample. And yet, it's bubbling with billions of stars, bursting with trillions of planets. Some of those planets, no doubt, had or have life on them. 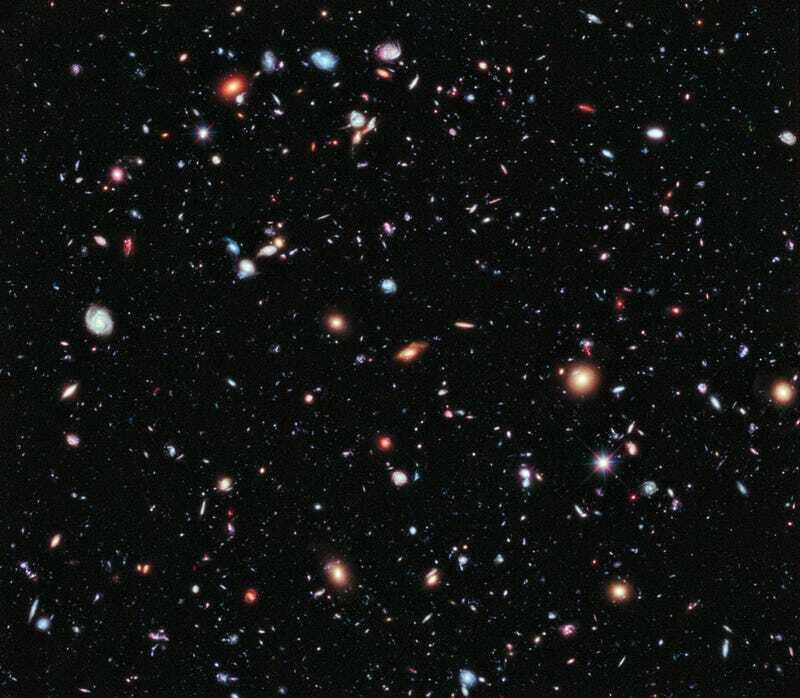 According to Dr. Garth Illingworth—of the University of California at Santa Cruz, principal investigator of the Hubble Ultra Deep Field 2009 program—"the XDF is the deepest image of the sky ever obtained and reveals the faintest and most distant galaxies ever seen. XDF allows us to explore further back in time than ever before." As Dr. Illingoworth says, the XDF is a "time tunnel into the distant past." Indeed, and it's the most beautiful time machine I can imagine. The image was created by using multiple photographs taken since 2003 using Hubble's Advanced Camera for Surveys and the Wide Field Camera 3. The XDF is the heir of the Ultra Deep Field images. This graphic shows (click to expand) the foreground (galaxies less than 5 billion light years away from us), background (between 5 and 9 billion years ago) and very far background galaxies (more than 9 billion years), which are "one ten-billionth the brightness of what the human eye can see." Soon, when the James Webb Space Telescope is operative, scientist will give the area of XDF another pass using its infrared instrument. Then scientists will be able to add galaxies that existed when the Universe was just a few hundred million years old. I don't know what are they going to call the XDF then. I vote for HFDF (for Holy F*ck Deep Field). If you want to learn more about this amazing image, you can chat with the XDF team this Thursday. Go to this Google+ webinar at 1pm.